Published By – Big Life Music Ltd. Published By – E.G. Music Ltd. Published By – EMI Virgin Music Ltd. Published By – Warner Music Ltd.
Track 1-1: Orb Music/Big Life Music Ltd./E.G. Music Ltd./BMG Music Publishing Ltd.
Track 1-2, 2-1, 2-4: Orb Music/Big Life Music Ltd./Copyright Control. Track 1-3, 1-4: Orb Music/Big Life Music Ltd./EMI Virgin Music Ltd./Copyright Control. Track 1-5: Orb Music/Big Life Music Ltd./Warner Chappell Music Ltd.
Track 2-2: Orb Music/Copyright Control/Buddah's Belly Music/Big Life Music Ltd.
Track 2-5: Orb Music/Big Life Music Ltd./E.G. Music Ltd./Unforgettable Songs Ltd./Perfect Songs Ltd./BMG Music Publishing Ltd.
Track 1-1: Do Not Erase, London. Programmed at The Coach House, London. 24,000 ft & rising. Track 1-2: Do Not Erase, London. Respects to Jasper. Track 1-3: Marcus Studios, London. Track 1-4: Marcus Studios, London. Programmed 25 miles above the Earth. Track 1-5: Berwick Street Studios, London. Programmed in Barcelona, Spain. Track 2-1, 2-2: Berwick Street Studios, London. Programmed in Soho, London. Track 2-3: Berwick Street Studios, London. Programmed in Lab Studio, Berlin. Track 2-4: Berwick Street Studios, London. Programmed in Brixton, Southside. Track 2-5 Recorded live at Trancentral, London, programmed in Inner Space. Steve Hillage appears courtesy of Ten Records Ltd.
On Rear: ℗ 1991 Inter Modo © 1991 Inter Modo. The copyright in this sound recording is owned by Inter Modo and is exclusively licensed to Island Records Ltd. in the U.K. In Booklet: ℗ 1991 Wau! Mr Modo. © 1991 Wau! Mr Modo. The copyright in this sound recording is owned by Wau! Mr Modo. and is exclusively licensed to Island Records Ltd. in the U.K.
On CDs: ℗ 1991 Inter Modo. Comes in a 'slim' double jewel case with eight page, cover exempted, black and white booklet. Credits and publishing information taken from the booklet. Inter-Modo logo appears on CDs, Wau / Mr. Modo Records logo appears on the undertray and booklet. 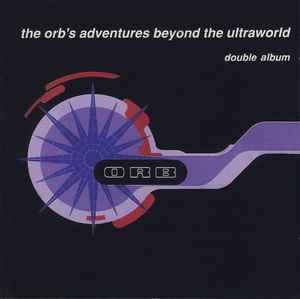 Spine lists the title as 'The Orb's Adventures Beyond The Ultraworld (Double Album)'. CDs list the title as 'Orb's Adventures Beyond The Ultraworld'. The printed total running times for each disc are incorrect, true values are given above. The printed durations are 59:01 for disc 1 and 53:14 for disc 2. From the pioneers of ambient house (though i hate labels), this piece of work for me at least is in the top five greatest ambient/chillout albums of all time, clever use of samples, deep liquid soundstage, seamlessly blended together and mixed,pure genius!! !